Breville BCG800BSXL Smart Grinder is the best coffee grinder. This is because it is very quiet, easy to use and clean. It is not difficult to adjust the grinder in order to accommodate any desirable size of grind and of any quantity of ground coffee that you may need. The coffee made by this grinder tastes so much better, more aromatic and fuller. Its auto-dosing system numbers each adjusted dose and you can monitor your activities using the Back lit LCD screen. This machine has a good value for money and is durable and reliable compared to other Coffee Machines. It is also easy to maintain when operated properly. 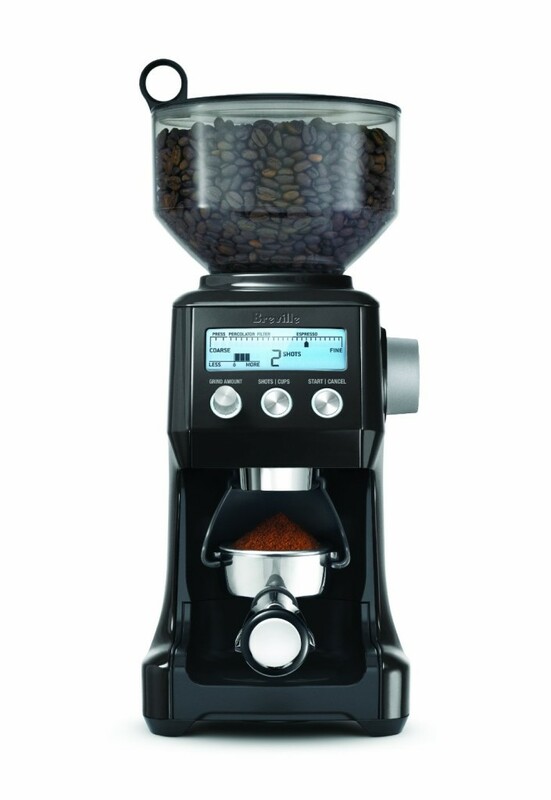 The dosing IQ technology is meant to automatically number each dose at every instance when grind settings are changed to enable you get precisely the quantity of grinds you need. It does not matter how coarse or fine the grind size is. This also eliminates wastage of grinds hence saving a few cash. The hopper of Breville BC800BSXL Smart Grinder bean contains a capacity of one pound, besides an air tight lid with a locking system. Its hopper is able to be disconnected out of the grinder base hence it can be easily applied to store beans at desired temperatures. Different machines and different modes of coffee preparations need different sizes. Breville BCG800BSXL Smart Grinder enables you to choose from 25 grind settings that are precise from the most coarse French press grind to the finest espresso. You may need a lot more ground coffee and in a bit less quantity. The Breville BCG800SXL Smart Grinder enables you to adjust manually the previously set quantity calculated by the Dosing IQ in order to satisfy your personal taste. This feature enables you to directly grind into a grinds container, paper filter or filter basket, ideal for more efficient coffee grinding. Contrary to blade grinders, the Breville BCG800SXL Smart Grinder’s conical burrs that are made of stainless steel minimizes grinding heat in order to protect the important oils contained in the coffee bean. This saves you the cost of cooling and maintenance because stainless steel does not rust easily. The Breville BCG800BSXL Smart Grinder has an LCD back lit screen which vividly displays grind setting, personalized grind quantity, and number of cups. The grinds which spill over during grinding are caught by a grinds catcher that can be removed, and the cord rolls around the base to make it easier for storage. Every part that gets into contact with the coffee are free of BPA. The accessories of this Smart grinder include grind container that has sealing cap, two portafilter cradles, in addition to a cleaning brush meant to clean the conical burrs. The Breville BCG800BSXL Smart Grinder is a high-tech device. A lot of people tend to think twice before investing in such a machine. This is because it has computerized parts and a digital screen that may render it a little bit difficult to maintain and repair in the long run.